A 24 x 24 mm close-up photograph of a thin section of chrysotile or from the Lowell Mine located in north-central Vermont taken in cross-polarized light. Photo by Mickey Gunter. A prekindergarten to 12th grade curriculum for clay science is presented based on the Benchmarks for science literacy and the National science education standards. These clay concepts support learning in chemistry, physical science, and Earth science and are divided into concepts and activities for early childhood, elementary, middle school, and high school students. Two studies addressing facets of the curriculum show the utility of the proposed clay concepts and suggested lessons. More work is needed to define specific ideas students may have about clay in the rock cycle, clay's role in everyday products, what clay scientists do, and to test the efficacy of the entire curriculum. The purpose of this study was to determine the improvement in descriptive vocabulary of preschool children as a result of lessons that focused on the physical properties of clay. During a six-lesson art-science unit, four and five year old children used familiar artificial clay, unfamiliar modeling clay, mud, and natural potter's clay to experiment with different techniques and to make a pinch pot, which they subsequently glazed and had fired. Throughout the lessons, descriptive vocabulary was repeatedly modeled and reinforced. Two pretest-posttest instruments were administered. Students improved in demonstrating targeted vocabulary words (e.g. pinch, bend, coil, flat) with a mean of 50% of the students demonstrating each of the sixteen words correctly on the pretest compared to 81% on the posttest. Students were also assessed on vocabulary used as they verbally described wet and dry natural clay samples and unglazed and glazed ceramic pieces. Again, students showed a significant increase in speaking vocabulary. However, passive and observational tasks, requiring little or no use of language and vocabulary, revealed minimal acquisition of targeted vocabulary. Research shows that content area knowledge and attitudes toward academic subjects can be enhanced when teachers use trade books in their classrooms. This article reports on an analysis of children's books relating to the topic of clay minerals. Various genres, including biography, fiction, informational books, how-to books, and picture books, are represented. The literary works described represent a wide range in terms of text difficulty and sophistication of concepts, offering opportunities for differentiated instruction. Teachers can teach scientific concepts and facts related to clay through stories, whether fictional or biographical. They can use books providing directions for hands-on activities to involve students in curricular projects with the goal of increased academic achievement. The text, illustrations, and photographs in trade books can motivate students to learn about clay minerals and provide resources for continued investigation. Clay minerals are widespread at the Earth's surface, compose a large percentage of sedimentary rocks, and are important components of many common products including brick and tile, tableware, sanitaryware, paper, paints, plastics, rubber, cosmetics, and pharmaceuticals. Knowledge of the role of clay industrial products supports attainment of science knowledge goals in middle school (Rule and Guggenheim, 2007). This simple pretest-intervention posttest study presents effective examples of clay science activities for middle school students that highlight the multiple uses of clay minerals in common products and support learning of other geoscience concepts such as crystal structure and resulting physical properties of materials. A class of twenty-one students at an urban middle school in central New York State participated in the study. Student scores on the pretest averaged 52% correct compared to 83% correct on the posttest taken seven weeks later, indicating the efficacy of the activities in teaching clay science concepts. A written survey three weeks after lessons had concluded showed students learned much about clay properties and clay use in everyday objects along with enjoying group work and the hands-on materials with clues. This article describes an experimental six-month study that was created to introduce first semester graduate students to geological research in fine-grained rocks. The study was conducted within a graduate-level Clastic Diagenesis course where students examined the mineralogical and chemical variability in shale samples that crop out in regions of different thermal maturity along the Ouachita Mountain Fold Belt. A project-based instructional (PBL) approach was used with a driving question of "what happens to shales during burial diagenesis?" This approach was intended to give students an opportunity early in their graduate studies to participate in authentic geologic research. Each sample was analyzed for the clay-mineralogy using XRD, whole-rock chemistry using XRF, mineralogy of heavy separates, character of the silt-sized quartz and feldspar, and grain size of the non-clay fraction. Qualitative data analyses from student interview transcriptions revealed that based on their experience with the Ouachita project students were able to approach their own thesis topics, regardless of the subject area with a more holistic and experienced scientific perspective. The depth and quality of the research questions they asked in their own subsequent research was influenced by their exposure to the clastic diagenesis problem-based project. 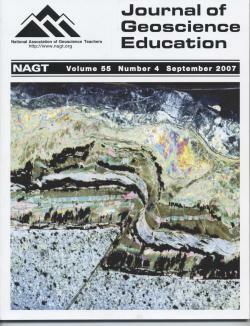 Developing competency in the analyses techniques was not the goal of this project but rather developing an overarching understanding of the process used when studying the diagenesis of fine-grained rocks. Evidence that this was achieved is demonstrated in the student's final presentation of the Clastic Diagenesis project at a regional geologic meeting. Clays are important industrial materials used for many purposes because of their plasticity and other unique properties. Clay science concepts can be used to effectively support learning of foundational science principles in elementary grades. Because preparation to teach science affects the quality of a teacher's instruction, this study examined preservice elementary teachers' ideas about clays before and after lessons on clay science that incorporated instructional approaches supported by the literature. These teaching methods included viewing a slide show of clay mineral structures and scanning electron photographs of clay minerals, along with explanations of the origin of clay minerals and their properties; matching clay products to cards that described the properties of clays employed by the products; and playing a game in which participants identified clay products in different rooms of a house. Before instruction, most participants were familiar only with ceramics as clay products, with less than half aware that clays were naturally occurring materials. Pre-instructional concepts of the geologic origin of clay were similar for preservice teachers who "guessed" or "reasoned" answers compared to those who said they had learned the information previously. Participants exhibited significant gains in knowledge of clay properties for use in various products from pretest to posttest. The Draw-A-Scientist test, a popular projective test in use for decades, reveals the drawer's attitudes toward science. This study examined and compared images of "scientists" and "clay scientists" drawn by 87 preservice elementary teachers before and after participating in instruction about the origin of clay minerals and their uses in everyday products. Images of "scientists" shifted from stereotyped white male chemists in lab coats to an increase in persons of color and females engaged in outdoor science. "Clay scientist" images shifted from white males working indoors or outdoors with clay or ceramics to include more females, more everyday clothing, and a broader range of clay products. The effective clay science instruction included pre-instructional assessment of student ideas, small group discussions, structuring of activities, hands-on concrete materials, visuals, and connections to real life. We present a geology field trip for first grade students, which includes four hands-on, age-appropriate activities on rocks, minerals, soil and fossils. The content of this program called Geokids adheres to the California educational standards and fits the physical sciences unit on sand, silt and clay for first grade. Over 600 students from eleven schools participate yearly in Geokids which is taught by university graduate and undergraduate student volunteers. The feedback from both university instructors and first grade teachers has been very positive and we are in the process of expanding our audience to include schools in lower income areas.